I made another nail art yesterday, and I'm calling it the Blue Cupcake because the colors used are only white and blue. For the base color I used Static Electricity, one of the new cool shades from LA Colors that I've found at Savers, Gaisano Mall last Saturday. I love the name Static Electricity, I felt like it represents me as a whole because I'm an electrical engineer and blue is my favorite color (as well as yellow and green.. lol). 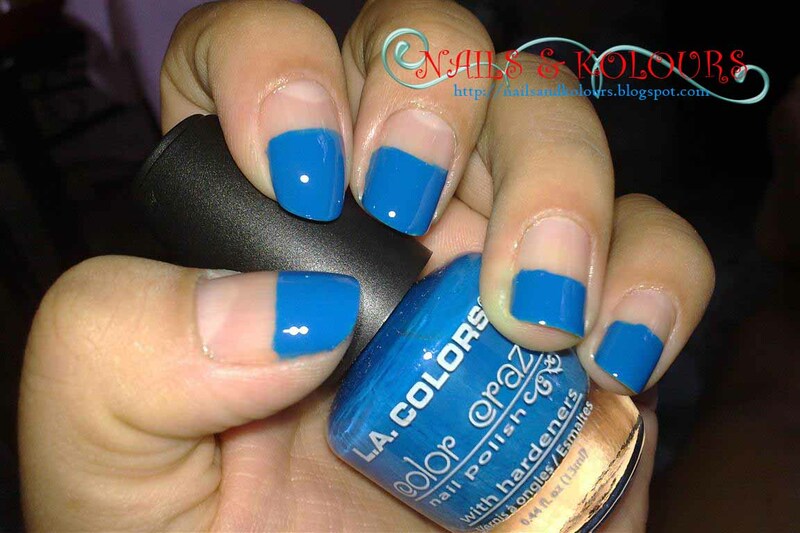 It has a creme not so light and not so dark blue shade and already pretty with just to two coats. I applied the nail polish halfway in preparation of the design I plan to make. Originally, I wanted to make pink cupcakes just like what I have seen in Youtube but I decided to create it differently, that is why I painted the base color on all nails halfway and chose blue. The result is quite cute for me, I was able to make a cupcake nail art that looks really like a cupcake. lol.. Hmmm..But I'm not that satisfied with the white stripes on the rest of the nails. Maybe I should have left the plain blue on it. What do you think? I love the cupcakes on your nails! I love the white stripes and dots. Has more fun value than the plain one. I got a white flower with a shiny stone on the middle done. I didnt know that they use tooth pick in to create the designs. I cannot wear nail polish. It makes my nails worse off. Yours look interesting. I liked it when it was just that simple blue color. love the colors!!! who says blue is dull right??? Your such an artist sis... I love the design..wow! In my part, this is the 1st summer that I did not try on manicure just because walang summer dito kainis... ang lamig cannot go out to make kutingting with my nails. I have never tried putting a blue nail polish I might as well do this too. Thanks for the visit I do appreciate it. I love the first photo! It looks paint-dipped and it turned out lovely! I am having difficulty finding the right post for me to comment. I am a man, that is why. But to be honest I did some nail polishing back in college. Those were just black nail polish. That was the time when I felt like I was a "rock musician", you know?! I tried looking at your labels, I saw that says "food" but when I clicked, still, the post is about nail polishing. LOL! Anyway, I saw this nail post also from one of the BC bloggers, perhaps you haven't checked this one, the nail polish here were just so cool also. This is from Jhari!